The Lavials® VL13H Lab Vial, as one of the smallest containers available, is well-suited for use for sampling packaging. Our Lavials series are produced with the highest quality pink Anti-Static polypropylene material, resulting in a container with a surface resistivity between 109 to 1012 ohms per square while offering a high surface resistance to enable basic anti static charging of products contained within. Certifications, Regulatory Data Sheets, MSDS, and Drug Master File assistance is available upon request as we ensure and guarantee strict Material Lot Number traceability with each plastic container we produce. The Lavials® VL13H hinged-lid design creates an air and moisture resistant container applicable in diverse industries including product packaging, workplace organization, lab supply or tool storage. This Anti-Static Pink plastic vial inhibits the buildup of potentially damaging electric charges that result from triboelectric friction, making it perfect as protective packaging during transport or storage. **We strongly recommend that customers determine whether our containers are safe, lawful, and technically suitable for its intended use in your particular context. Samples are available upon request for testing purposes and validation. Please contact us if you have any questions. 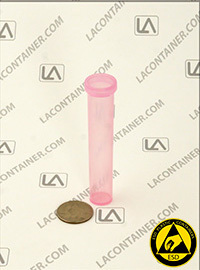 Lavials® containers in smaller quantities. 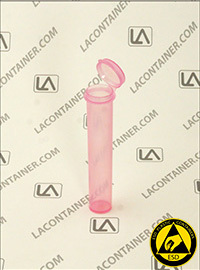 ESDplasticcontainers.com now has a selection of Lavials® containers with no minimums.